The notebook that everybody wants is the Macbook air and now that you got one you of course want to keep it save and away from harm. A boring cover or case is what you can find anywhere but a nice one is more difficult. But we found this sleeve with a nice rocket on it. This sleeve comes in two version one for the 11″ and one for the 13″ Macbook air. The time of generic cases is long gone now you can get a nice sleeve specially made for your computer. This laptop sleeve is handmade by Rickshaw in San Francisco. And it is water resistant and has protective foam and ultra plush lining to keep your Macbook air safe. 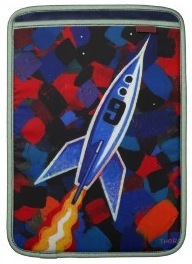 Beside have the rocket on the front side (see picture above) there are more rockets on the back (click picture above to see that) and you have a choice in binding and lining color to make this case even more personal. Now came the time to get your own Rocket Sleeve For Macbook Air. So you Macbook Air travels the world with you but an amazing looking machine like the Macbook Air needs an amazing looking sleeve. The people for Rickshaw are making the perfect sleeve for your Macbook Air. A sleeve that looks like the Tardis from Doctor Who that is the sleeve a real fan wants and this sleeve will be perfect for your Macbook as it specially designed for it. It comes in two versions like the Macbook Air in 11 or in 13 inch. And to get the Tardis on a sleeve the Doctor travels to San Francisco where Rickshaw makes every sleeve by hand. And you as the Doctor Who fan can choose the color of the lining and the color of the binging so that your Tardis will be special for you. 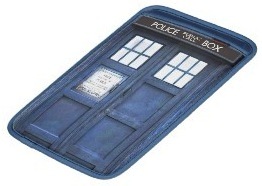 If you are a Macbook Air owning Doctor Who fan then stop what you are doing and order this Doctor Who Tardis Macbook Air Sleeve. So you got an iPad or iPad2 and now you carry it around all the time but don’t really like those cases. How about a nice sleeve? 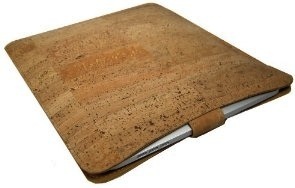 This one is made out of cork and that first of all that is all natural and it looks great and protects your iPad to. Get a Cork sleeve and your live will change as you iPad will look so much cooler. Go order your Cork iPad Sleeve.